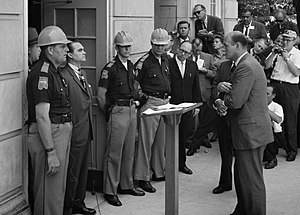 Attempting to block integration at the University of Alabama, Governor stands defiantly at the door while being confronted by Deputy U.S. Attorney General . (Photo credit: Wikipedia) Is this a good example of “visionary leadership” or bad? No, despite the name, this is not about Organizational Vision and Mission Statements. Actually, this is about the role of vision, or actually who is to be the source of vision, in missions. This post is a Thesis and an Antithesis without a Synthesis. Someday I hope to have a synthesis. Vision from the top is in many ways the classic viewpoint. The king may not do all that much in his kingdom, but one thing he does is stand at the helm of the ship of state guiding the overall direction the people should go. When I took ministerial leadership class in seminary, I was told the same basic idea for the church. “The pastor is the visionary in the church.” In corporations, the Chief Executive Officer is often selected for leadership skills and vision, rather than familiarity with the business or product line. Denominational structures and Mission organizations tend to do the same thing. In some ways this makes sense, and it seems foolish to consider another option. There are definitely those who question the classic thesis. The king may be at the top but he has two things that work against him as a visionary. He is the most out of touch, in many ways, with what is “really going on” in the kingdom. He is shielded by levels of bureaucracy (and social stutus) that filter and shade the information that he has. He has a strong vested interest in the status quo. His job security exists partly in not rocking the boat (to return to the ship analogy) too much. Additionally, when vision is left to the hands of only the person(s) at the top, the visions of the vast majority are squelched. The Civil Rights movement of the United States, and the People’s Power Revolution of the Philippines occurred due to the vision of people who were not in political power. In fact, often the people at the top, the so called visionaries, are not visionary at all. Or their vision is self-serving. Or “their” vision is simply parroting the vision of another (who may or may not have good vision). In this view, vision comes from the people who most understand the situation. Vision to right wrongs comes from those who are downtrodden or at least interact most with the downtrodden. Vision as far as direction comes from those who DO rather those who TELL WHAT TO DO. Thesis; Vision from the top. Round 2. The people at the bottom are too busy doing to take time to analyze. They have a firm understanding of the little picture, but cannot (or at have not had the opportunity to) grasp the big picture. If people at the top want to maintain the status quo, the regular people often want change, but change without clear focus– change for the sake of change. The multiple visions often lead to chaos, and can make things worse than before. The clear vision of the lowly National Socialist party of Germany in the late 1920s into the early 1930s led to the replacement of a fairly incompetent government with a hugely destructive, diabolical power structure. The laissez-faire tyranny of royal France, led to a devastating poorly focused revolution and the ascedancy of another eventual tyrant. Putting vision into the hands of the people is not such a great idea. Besides, even the positive visions “of the people” typically did not come from the absolute bottom. The People’s Power Revolution had as its two leaders, a member of a family with great monetary and political power, and the local leader of the Catholic church. With the American Civil Rights movement, the voice of positive change came, to a large extent from a major religious leader. A lot of the other voices from that period were far more destructive or self-serving. Leaders must lead. They have the wisdom and perspective to see what needs to be done. Antithesis; Vision from the bottom. Round 2. Much of the problems listed above with grassroots visioning seem to come not from the bottom but from oppression at the top. When those at the topic see themselves as the sole source of wisdom, and sole wielder of power, pressure for change builds. If that pressure is not given a healthy path to relieve and work, such pressure can lead to dire results. The problem comes from leaders who see their followers as tools to enact their own vision. Leaders should facilitate and empower others. Leaders should wisely disperse power not hoard it. They should encourage others to envision a better future. "Websterian" Theology and the "Spirit"
Maybe Imperfection is a Good Thing? Honk If You Love Jesus???? How Do Abusive Churches Learn to Abuse?